After a brief, but thorough cleft palate lesson last night, we dove in head first and spent the morning at the weekly cleft palate clinic at Komfo Anokye hospital in Kumasi run by Dr. Peter Donkor. Patients travel from all over Ghana to come and see Dr. Donkor for cleft palate repair. Cleft palates are caused by a malformation of the palate during embryological development and, depending on the extent of the cleft, they can impact infant feeding as well as later speech development. Even after cleft palate repair, it is difficult without training to relearn how to say certain sounds, which are impossible to make when there is a cleft in the palate. As speech pathologists, our job is to work with mothers to guide and train them in proper feeding techniques for infants born with cleft palates. We also work with children and even adults who have had cleft palate repair to train them on proper production of many speech sounds. We arrived at the hospital early Wednesday morning and met up with a number of dental students. Most patients had come in to meet Dr. Donkor to see if they were eligible for cleft palate repair, or in the case of one individual, to see about fixing a cleft palate that had been repaired, but since, reopened. 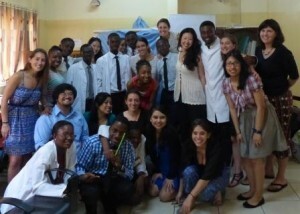 While the patients waited to meet with Dr. Donkor, we saw each of them. For infants with cleft palates we assessed how they were fed, what they ate, how much they ate and such. For the most part, we were amazed by the strong bond infants had with their mothers. The mothers were able to read vocal and facial cues from their children immediately, which is essential to proper feeding and nourishment. We gave a few key recommendations to ensure mothers maintained safe and supportive feeding habits. These included holding the baby upright, burping every 5 minutes during feeding, and holding the baby upright for 20-30 minutes after each feeding. We advised that it is essential to limit feeding to 30 minutes. This helps to prevent air accumulation in the stomach and potential food in the lungs, both of which can cause choking. Additionally, we had the opportunity to work with older children and even a 30 year old woman and mother of a beautiful baby. It was a profound experience to witness these individuals elicit sounds that they have never had the skills to produce before. We were so pleased at how quickly they learned and absorbed our recommendations. Later we were able to meet each valuable member of the Cleft Palate Clinic’s team [surgeon, orthodontist, nutritionist, dentist and social worker] and observed their assessments and follow ups. Overall, today was a valuable learning experience where we were able to apply our academic theory to clinical work. To reward us for a hard work, it was off to the largest open air market in West Africa. Endless aisles of vibrant and vivid colored fabrics, leather goods, and even furniture invaded the space. It was a complete induction of all 5 senses and a wonderful experience. We all shopped our faces off.